In collaboration with The Works. The summer holidays are nearly upon us! Where has the time flown! In fact, today is the last day of this school term for my children as we’re heading away a few days early for a weekend Chocolate Experience in Brussels! Yes, it’s been ok’d by the school – we’re a little bit more laid back up here in Scotland than some of your English schools! Still, six weeks of school holidays means a lot of time to fill entertaining the children and, although I’d prefer to get outside and explore and be adventurous, sometimes the weather just isn’t on our side. That’s where my crafting drawers come in handy. I tend to hoard bits of ribbon from chocolate boxes, coloured papers, embellishments and, oh, anything that might come in useful again some day, and store them in ‘the crafting drawer’. 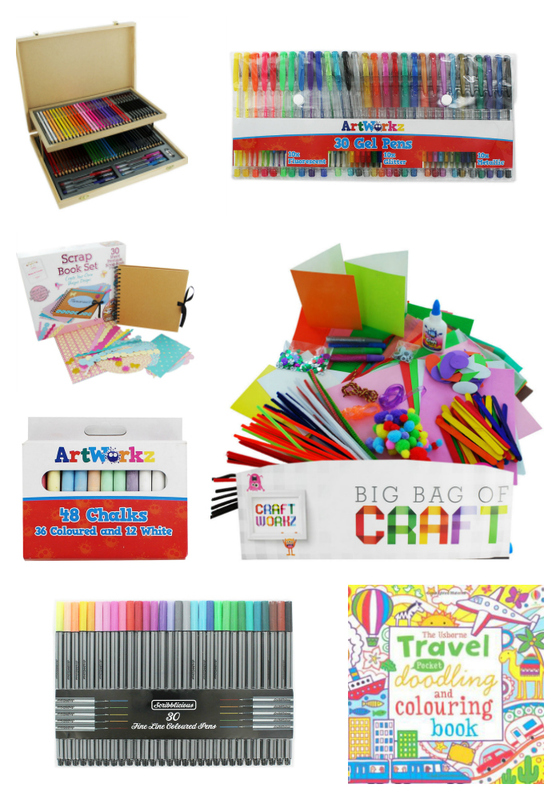 I also like to top up the drawer with new supplies and crafting kits, all available from The Works and at prices that won’t break the bank! What would be on your summer crafting wish list? Let me know in the comments! This is a paid post. Top image from Shutterstock, crafting images from The Works. Erin is only 6 months old but I already have a craft box building up for her. I save things like yogurt pots etc. to make into paint pots! Oh my goodness I must admit I have a thing for pretty stationery and crafting supplies. These all look so lovely! Love this wish list and yes to everything, especially since T has ran out of so many of them! Will have to do some shopping too. Brilliant wish list, that would keep my girls busy for hours!!! MELANIE EDJOURIAN recently posted…Join a Haribo Starmix Team and Enter to Win Great Prizes! Oh I don’t have kids but I do love crafting and scrap-booking its just supper fun. I love to be creative it just helps me relax and express my creativity!! I need to make a craft wish list! Gel pens are lush, I loved them as a tween – especially the smelly ones! Harriet from Toby & Roo recently posted…Sports day :: Why it should be optional. Gosh you are organised. We’ve got three weeks to go but I like the idea of assembling all the craft materials in preparation. My two are normally bored by lunchtime on the first day of the holiday! I will sign my name under wooden set too; it looks perfect! Crafting can be fun and relaxing. The kids love painting and colouring so will be doing a lot of that. I love making things with the kids and they have a craft box filled with all sorts of bits and bobs that I have saved from things. We also love doing a lot of colouring and we already have those coloured pens. Do schools in Scotland really break up at the end of this week?! There’s about 3 or 4 weeks left where I live – you lucky things 🙂 Sounds like you’ve got lots of fun stuff planned! These are some awesome picks. My daughter loved drawing and writing with gel pens! We gave our craft box an airing at the weekend – Its great to find stuff that you forgot about. We love chalks for painting on our drive – Drives the husband mad though! Have a great summer – I’m sure those 6 weeks will fly! I love these activities! I must try these with the children I nanny for! 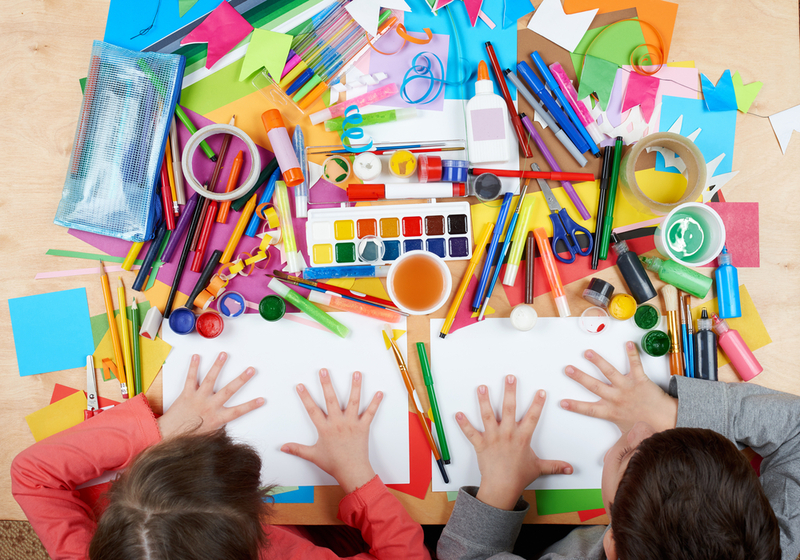 Ooh its always fun doing crafts with kids, I like the look of the kids big bag of craft. SO many great ideas! I’ll have to pick these up at The Works – they’ll be lifesavers to keep my crafty kids busy over the holidays.